Do you have a minute to spare to learn some English? 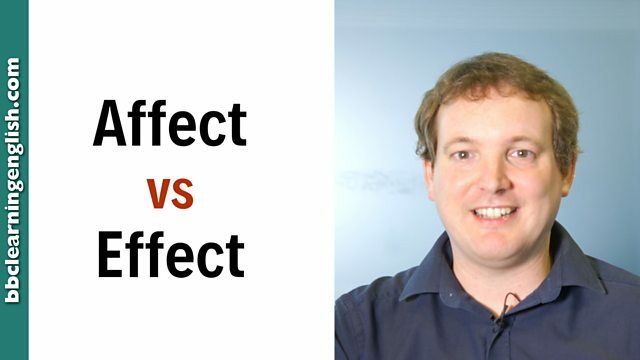 Here's Phil clarify the difference between affect and effect. Give us 60 seconds and we'll give you the English! Hi! I'm Phil from BBC Learning English. Today, I'm going to tell you the difference between affect with an 'a' and effect with an 'e'. Just remember that affect with an 'a' is a verb. It means 'to influence'. So, for example: Tiredness is affecting my work. Effect with an 'e' is usually a noun, and it means 'the result of something'. The effect of not having breakfast is to feel really hungry. Effect can be a verb. It's very formal and it means 'to implement something'. The management effected a new policy. So if you find this difference affecting your English, just remember that affect with an 'a' is a verb and that effect with an 'e' is usually a noun. And the effect will be that you don't make any more mistakes! Affect is usually a verb and means 'to influence'. Tiredness is affecting my work. People's confidence in the future affects the stock market. The earthquake affected people for miles around. NOTE: Affect can be used as a noun, though rarely. It is connected with the context of psychology and means an emotion or desire that influences behaviour. Effect is usually a noun. It means 'the result of something'. The effect of not having breakfast is to feel really hungry. The aspirin's effect took a long time to start working. The romantic movie had a strange effect on his emotions. The management effected a new policy. Environmentalists around the world are trying to effect ecofriendly changes. Affect and effect sound very similar, but in British English ‘effect’ is usually pronounced /ɪˈfekt/ while affect is pronounced as /əˈfekt/. In American English they are often pronounced the same - /əˈfekt/. This pronunciation difference can be very hard to hear. Sometimes people do not notice the difference. Is the word being used as a noun or a verb? Check the sentence carefully! This is a verb... but which? Affect and effect can both be verbs, but only one meaning fits! Complete this sentence: It's still unknown whether social media will ______ us in a good or bad way. Double check the text above if you aren't sure! True or false: Affect and effect are pronounced the same way in British English.